Advent is a time of waiting, of looking forward to a worldwide celebration of Christ’s first coming as well as anticipating his promised Second Coming at the end of history. The Church gives us this time in order to help us keep our lives in order and to help us re-focus on the really important things. Who likes waiting? Waiting in line; waiting for an answer; waiting for the weather to change; waiting for the results of a test… These are not activities that tend to energize us. But what about anticipating? Do you like the idea of experiencing anticipation, of looking forward to something good that’s coming soon? That’s a different story. Anticipation involves waiting, but it gives substance to the waiting; it fills it with meaning, direction, purpose, and significance. It energizes us because it promises to bring us something we value, something that will give us joy. When we anticipate something, we actively get ready for it, instead of just sitting around waiting for it to happen. Advent is a liturgical season meant to be lived with deep spiritual anticipation. It is a time of year in which the Church invites us to look forward to spiritual gifts with a sense of joy. 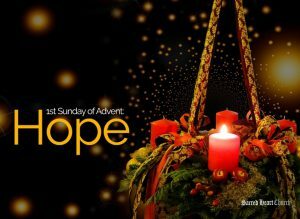 May this Advent be a season of hope and growth anticipating the coming of Christ this Christmas!